Break ground in almost any digital video game marketplace and you find a huge vein of Minecraft-inspired games. These titles focus on digging deep into the earth, gathering resources, and finding enhancements that allow you to delve further down. The glut of digging games makes it difficult for one to stand out, but SteamWorld Dig is a gem among the junk. This side-scrolling adventure deftly balances repetitive mining with satisfying, Metroid-like progression. Similar to games like Terraria and Super Motherload, SteamWorld Dig offers players a sliced, 2D perspective of the earth. The new PC version looks much better than its previously released 3DS counterpart, showing off nearly twice as much on-screen terrain. Shiny minerals and hidden enemies are easily spotted thanks to the cross-section view, assuming you have enough fuel in your lantern (which replenishes when returning topside). Run out and you’re left guessing whether that next dirt block takes twelve swings of your pickaxe or two. Your bag can only hold so many valuable minerals as well. Fuel and limited inventory capacity force players to return to the surface where they can buy useful upgrades like larger bags, armor upgrades, or equipment that makes you dig faster and hit bad guys harder. This carefully designed gameplay loop kept me hooked. Cashing in a huge payload feels great, and digging deeper with your new gear is even better. Perfectly placed warp points and droppable teleporters take the sting out of climbing back out of your hole. The art of digging tests your skills in platforming and puzzle solving. Planning your route out of the mine is as important as scrambling for pretty gems. Early on, this means digging a vertical shaft you can simply wall jump your way back up. Later on, dirt bricks that rematerialize and heavy, gravity-defying blocks make traversal more challenging. Scattered puzzles require players to think before they dig. For example, one situation presents players with a series of huge, impenetrable boulders atop vulnerable supports. You have to line up the big rocks into a path by correctly destroying the smaller structures. These fun little puzzles are tricky without ever feeling unfair. The payoff is usually a clutch of precious stones or a worthwhile new ability. As SteamWorld Dig’s robotic miner digs deeper into the ruins of a dead civilization, he’s rewarded with powerful forgotten technology. A steam-powered drill cuts digging down to a fraction of the time. A rocket punch clobbers enemies from a distance and makes digging upward easier. These upgradeable abilities are powered by scattered water pools our hero soaks up. Drilling through the earth like a manic mole is when the game shines brightest. Typical platforming powers like a double jump and a fall damage dampener come later on, and are warmly welcome. The platforming feels loose and sloppy at first, but the added mobility makes up for those shortcomings by the end. 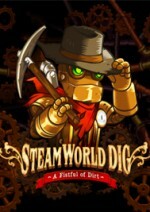 Unlike a lot of mining games, SteamWorld Dig ends. The story is practically nonexistent, but you know it’s coming to an end when your best equipment clangs against the ground in futility. The final boss fight puts all your hard-earned gadgets and tricks to the test, but by then my hero was such a powerhouse that he easily steamrolled the foe. The final battle is unmemorable, but doesn’t dilute the journey. I loved watching the strata gradually change from simple soil to the remnants of a lost society. SteamWorld Dig does a wonderful job of combing the disparate gameplay elements of mining and classic platforming into one polished package. Digging in is worth it whether you’re a Minecraft veteran, curious about the mining game frenzy, or just looking for some solid side-scrolling action and exploration. This side-scrolling adventure deftly balances repetitive mining with satisfying, Metroid-like progression.